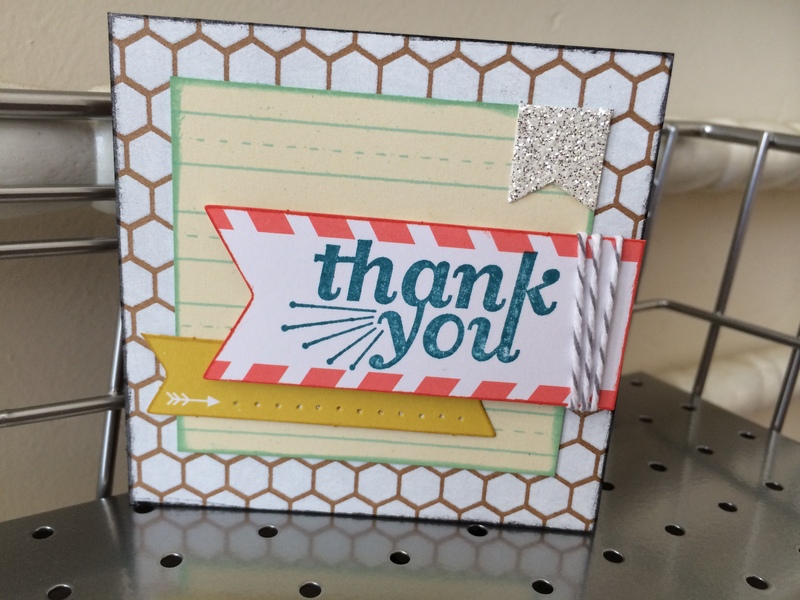 Here are a few cards made using the Everyday Occasions Card Kit from Stampin’ Up!, yet the layers have been rearranged or altered in some way. Most of the solid colored cards in this kit were designed to use the “back” of the card base that was printed on one side and solid on the other. For several of those, I preferred to turn it around and use the patterned side on top (as above). 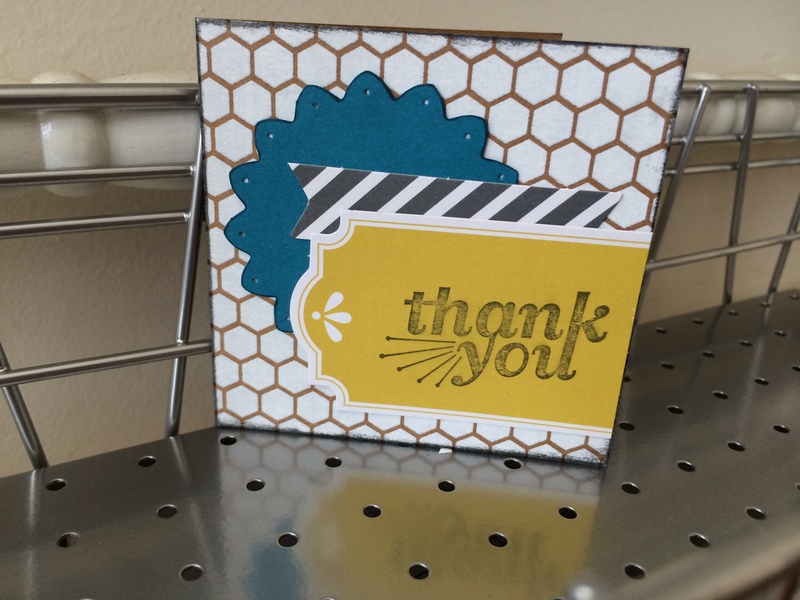 Some might find it too busy, but I liked it better than having a printed pattern on the back of my card. I also rearranged some of the layers, left a couple out, and added some brads, a doily piece, and an extra heart. 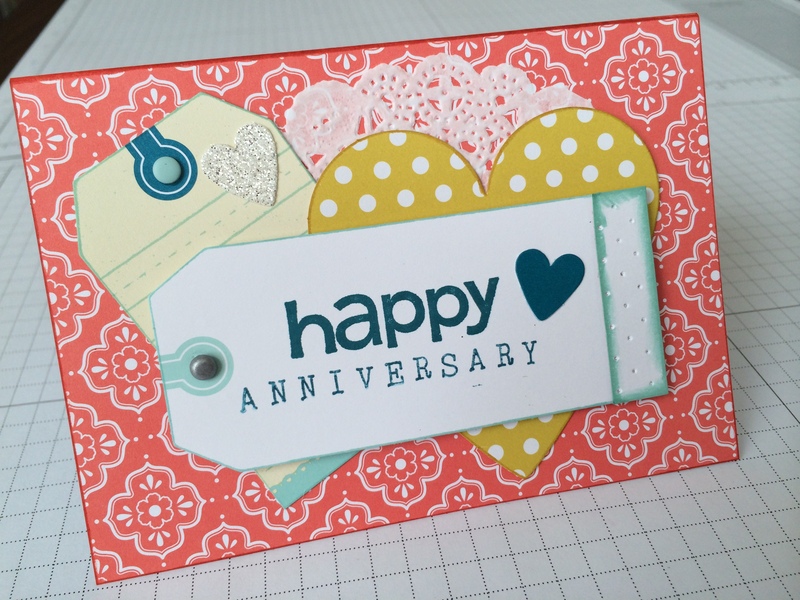 The “happy” stamp is from SU retired set “Polka Dots & Paisley,” and the “Anniversary” is stamped with the new Alphabet Rotary Stamp. As I got close to the end of my kit I noticed that there are several extra pieces. So, I added some to the cards that had fewer layers on the suggested design. For this card, I didn’t use any of the suggested pieces. 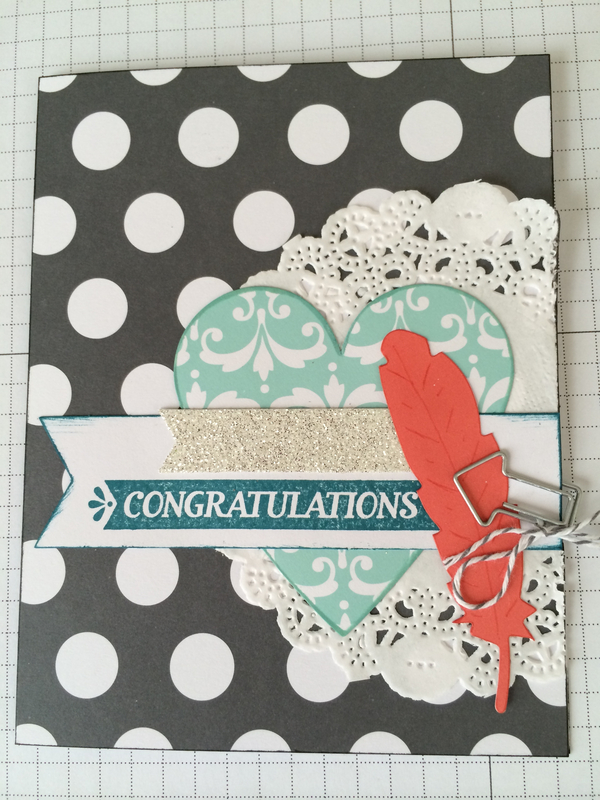 I used the same stamp, but added it to white card stock punched with the Decorative Label Punch. then to one of the extra kraft colored pieces in the kit. Added a couple of banners underneath and a star from my stash. Some extra ink too. And, done. Simple card. 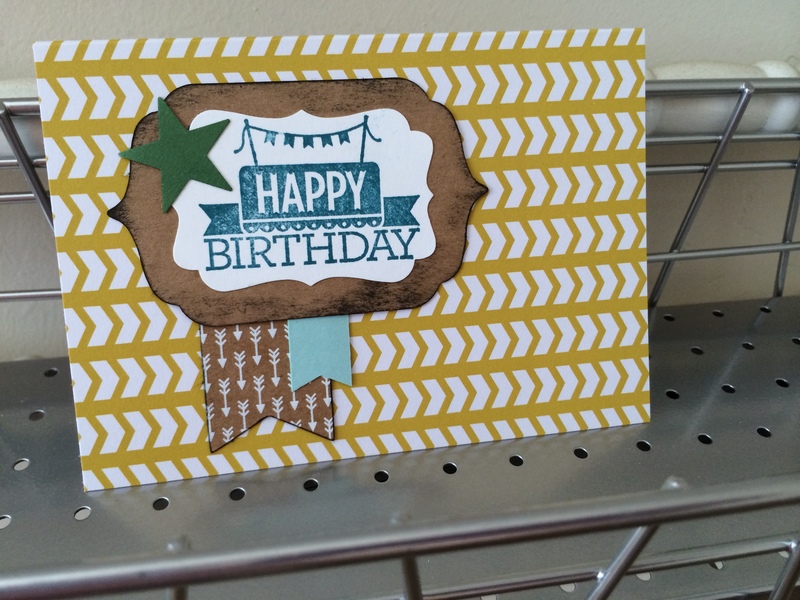 Another card that I added extra layers too. The kit instructions had only the yellow tag and some twine. I added a couple of the extra pieces and left out the twine. I also pierced that blue medallion and inked the edges of it and the card base. This one looks a lot like the sample in the instructions. 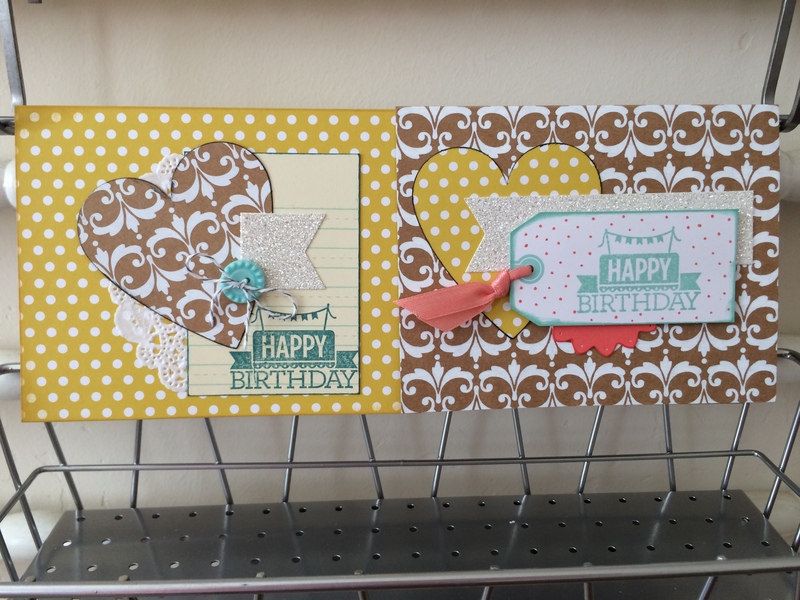 Except I turned the card base around to use the patterned side. Inked most of the edges that I could, and added a little extra glittery banner. Easy changes to step it up a little.